Cola and other sodas sweetened with artificial sweeteners are believed to be the perfect low-calorie drink, but what are the dangers of diet soda? While drinking a diet soda may seem preferable to a soft drink sweetened with sugar or high-fructose corn syrup, they may not be as good for your health as you might imagine. Along with artificial sweeteners, soda also contains artificial colors, artificial flavors, sodium, and preservatives. If you are cutting back on calories or you have type 2 diabetes, a diet soda may seem like the perfect replacement for a sugar laden soft drink; however, the dangers of diet soda expose you to risks you may not even realize. Artificial sweeteners may not be as safe as many believe. A great deal of controversy has surrounded artificial sweeteners, and aspartame in particular. While studies have shown aspartame and other artificial sweeteners to be safe, most lack evidence about their long-term effects. Anecdotal complaints suggest high levels of artificial sweeteners can lead to headaches, muscle aches, and other symptoms. If you are experiencing neurological pain and you drink diet soda, eliminate it for a few weeks and see if your symptoms go away. People with PKU need to avoid sodas containing aspartame, which can break down into phenylalanine. There is no correlation between drinking diet soda and weight loss. Merely replacing sugary drinks with diet drinks won't necessarily help you lose weight. If you are drinking diet soda in order to control your diabetes and weight, there is a chance its sweet flavor will induce what is known as the cephalic phase response. In some people, the sweet flavor of the soda is enough to both trigger sugar cravings and cause your body to release insulin just as if you had ingested sugar. The increased cravings can cause you to eat more, and may drive you to eat more sugar. All of the artificial chemicals in diet soda aren't particularly healthy for your body. Filling yourself full of chemicals can weaken your immune system and lead to other health problems. If you're drinking diet soda to quench your thirst, then chances are good you may not be drinking as much water as you should. Pure water flushes toxins out of your body, and you should drink a minimum of 64 oz. per day. Some diet sodas, particularly colas, contain caffeine. Caffeine is an addictive stimulant drug that can cause anxiety, irritability, insomnia, and mood swings. If you partake of caffeine daily, when you try to eliminate it from your diet you will go through withdrawal symptoms such as severe headaches, anxiety, and irritability. Diet soda can cause gastrointestinal distress by upsetting the acid balance of your intestinal tract. Researchers have linked diet soda to metabolic syndrome, a cluster of symptoms sometimes known as pre-diabetes. Both diet and regular soda has been shown to dissolve tooth enamel. 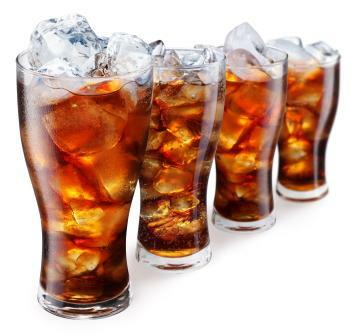 Cola intake may lead to a loss of bone density and increased risk of osteoporosis. Diet soda has been associated with loss of kidney function. The best alternative to diet soda is pure water; however, if you need bubbles, then try mineral water with a squeeze of citrus. Tea also provides a healthier alternative, and decaffeinated green tea even confers antioxidant health benefits. The next time you plan to drink a diet soda, think about the health risks involved. While an occasional diet soda may not cause health issues, drinking one or more every day could lead to health problems.